It takes all of our hands, together, to help each other! Thank you, to everyone who has donated to this cause. Many will receive assistance from your generosity and from Tom and his gift. The lucky winner of Tom's statue is Kathy Alcott from Hopkinton, NH. She will allow us to use the statue once each year to help us raise awareness and to support the gift of a free cord of firewood to a deserving person in the community. Our little community is so special, even for all of New Hampshire. In the New England-led tradition, our families teach their children by doing. If a neighbor is elderly, or medically has trouble getting around, then someone just steps forth to shovel a walkway, sand some steps, or plow a driveway. If a neighbor is exhausted from day-in and day-out caring for a loved one, then someone steps forward to run errands, or get groceries or walk pets. If a neighbor’s pipes break, causing flooding in the house, you loan a sump pump if you can, if not offer them shelter. About 12 years ago when friends found it almost impossible to keep up with rising costs of fuel, the Contoocook Carry Fund, through its Triathlon (www.contoocookcarry.org) and generous donations from residents and businesses was able to give oil, propane, kerosene and wood. To supplement this effort, the Congoran family also started the Sean Powers Wood Bank in 2008 (www.woodforwarmth.org). Since its inception, each November great numbers of men, women and youngsters just magically appear to cut, split and stack firewood for their neighbors for emergencies. 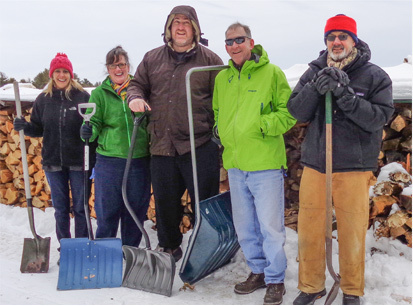 Others come with trucks to take the wood out to many in the community , giving them a head start in facing the harsh conditions of our New Hampshire winters. That day (first Saturday after Veterans Day) will always remain a blessing, as much for those who are involved with the preparation and giving of the wood, as it is for those who are the happy recipients. None of our neighbors should have to choose between purchasing medicine, buying sufficient food, or keeping their aging parents, or their children warm. It is incumbent upon all of us to care for those who need our help. And emergency wood from the Sean Powers Wood Bank. emergency wood access and some furnace repair, if resources permit. Federal Fuel Assistance Program—one monetary grant per household to go to vendor for fuel assistance.